Troma Entertainment recently send the horror chamber information that they will announcing the official entries for the short film category on Monday. The festival will taking place at the Paper Box Theater in Brooklyn, NY on June 24th and 25th. Admission is Free for the event. Greetings from Tromaville! The 16th Annual Tromadance Film Festival acceptance committee will announce this Monday, June 15th, the list of short films that will be playing at Paperbox Theater big screen during this year edition. The titles have been selected from more than 400 submissions from all over the world and represent the finest of independent filmmaking. Feature Film selections will be announced few days later. The 2016 edition of Tromadance will be held in the Paperbox Theater in Brooklyn, NY, on June 24th and 25th. 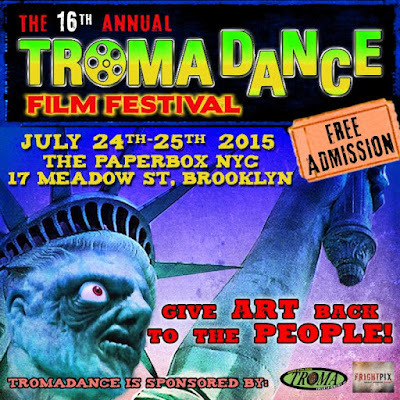 As always Tromadance is completely FREE. Submission fee FREE. Admission FREE. Red carpet FREE. The only film festival from the people, of the people and by the people.